Reporters Without Borders has hailed a report by Stephanie Wang of the OpenNet Initiative on the way the Burmese junta, the State Peace and Development Council (SPDC), cut the country’s internet connection on 29 September. Founded by the universities of Harvard, Toronto, Oxford and Cambridge, the OpenNet Initiative studies internet filtering issues and the social impact of new technologies. Published on 22 October, Wang’s report, entitled "Pulling the Plug," describes the process of Burma’s isolation. For two weeks, a news blackout was imposed and most Burmese got their news from satellite TV and radio. Excerpt from the RSF report: "Control of the internet was facilitated by the fact that Burma’s only two ISPs, BaganNet and Myanmar Posts and Telecom (MPT), are state offshoots. The OpenNet Initiative report goes into detail about how the shutdown was implemented, with times, ISPs involved and methods used. "The report says internet use increased within the country during the crisis because it was always possible to use censorship-evasion techniques. The intranet carried on functioning correctly and MPT provided a connection to the sites of military offices (ko-hite.blogspot.com, myochitmyanmar.blogspot.com and drlunswe.blogspot.com) and to those sites that offered no political news. Some sites such as dathana.blogspot.com and niknayman.blogspot.com did however post news about the demonstrations during the blackout that were not censored. "'Many believe that the breakthrough uses of the internet over this period have enabled some irreversible gains," the report says. 'Multiple generations of Burmese living locally and abroad have found linkages to each other as blogging became increasingly recognised as a valuable source of information (...) even the vast majority of Burmese without access to or knowledge of the internet may have benefited from the enduring achievement of a small band of citizen bloggers and journalists.'" Burma was ranked 164th out of 169 countries in the Reporters Without Borders 2007 world press freedom index. Since the demonstrations got under way in September, eight journalists have been detained and a photographer has disappeared. Full report - "Pulling the plug: A technical review of the internet shutdown in Burma"
sources (see story below). John, one of the pioneers of Australian journalism research by practitioners, says he would be interested in hearing about other journalists' experiences with legal and political attacks on source confidentiality. Excerpt from the Sydney Morning Herald (Oct 25, 2007) story about their awards: "[Melbourne] Herald Sun reporters Gerard McManus and Michael Harvey were convicted and fined in June for refusing to divulge the identity of a source who leaked information in 2004 about the workings of federal government veterans affairs policy. The pair argued they were upholding their professional code of ethics, but the judge ruled they were not immune to criminal charges. Brisbane's Jschool awarded Mr McManus and Mr Harvey honorary doctorates for their 'courageous stand in upholding the code of ethics by maintaining confidentiality of sources'." "It’s a grim time for democracy and civil rights in New Zealand with 17 'terrorism suspects' arrested in para-military raids across the country this month. For many people the situation is confusing at best but for those who know the people arrested it is astonishing. How could the police believe a group of Maori sovereignty activists, peace campaigners and environmentalists could pose a credible terrorist threat to New Zealand? The police have raised the spectre of terrorism despite, after 15 months of intensive surveillance, no decision yet being made as to whether terrorism charges will be laid. In the meantime the damage is being done. The public are being softened up to accept that we have terrorism in New Zealand. Under the Terrorism Suppression Act 2002 a terrorist is defined as someone who, for political reasons, causes '…serious disruption to an infrastructure facility, if likely to endanger human life…' This broad definition would include many of the protests against the 1981 Springbok tour. It threatens to demonise legitimate political dissent. Even people committed to non-violence with no intention to harm anyone or damage property can qualify as terrorists. "Meanwhile the latest Terrorism Suppression Amendment Bill is being pushed through Parliament. Under this law New Zealand would automatically adopt the UN (effectively the US) list of terrorists and terrorist organisations. A law like this in the 1980s would have made it illegal to provide support for the African National Congress in the fight against apartheid or for campaigns to have Nelson Mandela released from jail. Today groups such as Hamas, despite being democratically elected to government in occupied Palestine, would be a designated terrorist group (as it is in Australia). "A Kiwi added to the list by another country (as a result of police action last week for example) would have great difficulty being removed from the list. Sweden and the Canada have faced huge difficulties with their citizens being designated in this way through the UN process. The new legislation also sidelines our courts in favour of the Prime Minister designating and then reviewing terrorist classifications. Why should the PM be judge and jury? Under this proposal someone like Ahmed Zaoui wouldn’t have had a chance. Prime Ministers are susceptible to international pressure. It is only a phone call away. At least with the courts there is the semblance of independent scrutiny. "The government says the police, SIS and lawmakers are all working hand in hand to keep New Zealand safe. The truth is that our lawmakers are blindly putting in place savage attacks on civil rights while the police and SIS are eager to test their new powers and are excited at the prospect of joining the war on terror. "As it is New Zealand’s anti-terror legislation is set up to demonise dissent and legitimate political protest while removing civil rights safeguards. Dissent provides the oxygen on which a democracy depends. We throttle it at our peril." "Maori see symmetries between the Terrorism Suppression Act and the 1863 Suppression of Rebellion Act. The targeting of mainly Maori as 'terrorists' in fact mirrors the earlier legislative labelling of those Iwi [that] resisted the land confiscations as 'rebels'. Tuhoe see particular parallels with the fatal police raid on Maungapohatu in 1916. The unthinking or deliberately provocative setting up of the latest police roadblock on the confiscation line simply add to the grievance and the sense of colonising deja vu." Saturday 27 October is an international day of action to defend civil liberties and oppose the use of terror laws. Stand up for all our rights. What is happening where. 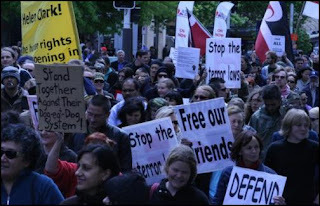 Auckland: Demonstration Saturday Oct 27th at 12 noon meeting in Aotea Square. Amirah Ali Lidasan's tour of New Zealand gets under way today with a bid to make Kiwis better informed about the political struggles of the Muslim minority in the Philippines. 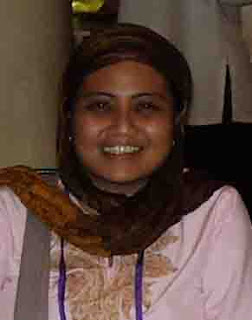 Amirah is national vice-chairperson of the Suara Bangsamoro Party List Organisation, which seeks representation in Congress for the Philippines’ several million Muslims - the Moros. She is a young progressive Muslim Filipina with a history of senior leadership in the student movement in Manila and is a leader in groups such as the Moro Christian People’s Alliance. She has an international profile. In March 2007 she was part of a Philippine human rights delegation which toured North America and Europe, drawing international attention to the human rights crisis at home. Campaigner Murray Horton from the Philippine Solidarity Network of Aotearoa says: "Amirah Ali Lidasan’s tour presents a unique opportunity to hear firsthand about a war in our own backyard that is almost totally unknown to New Zealanders. She is the first Filipino Muslim speaker that we have hosted, and a Muslim woman at that." More than 200 people have protested in downtown Auckland on Saturday over this week's controversial dawn raids in New Zealand and the arrest of some 17 activists. The protesters condemned the police actions and ridiculed the country's proposed new terror laws. Scoop's Joe Barratt reported: "Showing a unified front, the protest was attended by a wide range of activist groups, and also included family and friends of the accused. But for many there is also the larger fear of what the arrests represent, and of what could happen if the legislation amending the Terrorism Suppression Act of 2002 currently before Parliament is passed." Leading Tuhoe activist and campaigner Tame Iti (right) was among the 17 arrested, as police swept Maori sovereignty, peace and environmental activist groups. Tuhoe people accused the police of terrorising an entire community with heavily armed raids and by boarding school buses. The Tuhoe tribe never signed the Treaty of Waitangi and has a long history of resistance for their tangata whenua rights against colonial and state rule. The police raids follow international pressures for New Zealand to adhere to the Declaration on the Rights of Indigenous Peoples. New Zealand was one of four countries that voted against the UN Declaration, along with the US, Canada and Australia. Mainstream media have been accused of being one-sided. Former Listener editor Finlay Macdonald, writing in his weekly Sunday Star-Times column "Law of the jungle" , said: "Once again, the interests of national security trump those of open justice. Public scepticism quite reasonably grows. Last week's raids and arrests were conducted under both normal criminal law as well as the Terrorism Suppression Act, although no actual charges have been laid under the latter. The question has to be what distinguishes these alleged offences from any ordinary criminal or conspiracy case? As ever with issues such as these, we are implicitly asked to take the authorities on trust. Unfortunately, recent experience only encourages cynicism." A Defend Civil Rights website has been established. Auckland protest photo by Joe Barratt. provided impetus for Maori, Pasifika and other NZ media research. Says Laban: "This centre demonstrates commitment to our cultural diversity, but also to critical thinking and the pursuit of excellence." Pictured: Luamanuvao and PMC director David Robie at the unveiling of the PMC plaque. Photo: Alan Koon. 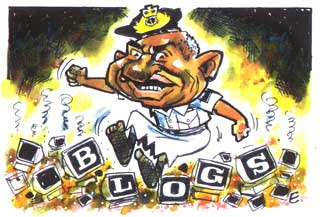 While regime chief Commodore Voreqe Bainimarama and the vexed Fiji question irritates a couple of pale southern neighbours at the Pacific Islands Forum in Tonga this week, Pacific Journalism Review has published an insightful inquiry into the post-coup blogging issue. And the regime has landed itself on hot coals. Sophie Foster, a onetime editor of the now defunct Pacific Islands Monthly and a former senior editorial hand at The Fiji Times, reckons the military is partly responsible for the number of political blogs that have expanded the media landscape in Fiji since the fourth coup last December. She says blogs have flourished because of the military squeeze on dissenting opinion. Sophie is now a postgraduate student in Pacific media studies at the University of the South Pacific in Suva and she is clearly making good use of her research time. In her PJR paper, Sophie says that while some blog content was racist, defamatory, provocative and irresponsible, the argument for a free, responsible press has also been also strengthened as an option worth maintaining in any society. This edition of PJR has been produced jointly by the USP journalism programme and AUT University's Pacific Media Centre. PJR cover cartoon by top Kiwi cartoonist Malcolm Evans. Incidentally, in the latest Reporters Sans Frontieres world press freedom index, bloggers are reported to be threatened as much as in international media. A survey of more than 500 New Zealand journalists has revealed marked unhappiness about levels of pay, resourcing and training, reports the Pacific Media Centre. The “Big Journalism 2007” survey found that, while many individual journalists are very satisfied with aspects of their jobs, overall most want improvements in (respectively) pay, support, mentoring and staffing levels.They want more opportunity for discussion and input into ethical and professional issues such as sensationalism, more guidance on how to cope with commercial and advertising pressures, and more time and resources to pursue investigations. The survey, titled "Under-paid, under-trained, under-resourced, unsure about the future - but still idealistic", published in the latest Pacific Journalism Review, is the first to ask NZ journalists what they think about a variety of topics such as quality of news coverage and their ethics and standards. The survey revealed a generally ethical stance among journalists, with most agreeing that NZ journalists do not omit or distort relevant facts, and that stories are based on journalistic rather than political or commercial values. Asked to rate the quality of NZ news coverage, journalists rated sports coverage the highest, while foreign coverage got the lowest rating, at slightly below average. The survey was conducted jointly by Massey University lecturers James Hollings, Alan Samson and Dr Elspeth Tilley, and Waikato University associate professor Geoff Lealand. It builds on Dr Lealand's previous surveys of NZ journalists. The old and the new journos, according to cartoonist Malcolm Evans. New Zealand's rugby World Cup broadcaster TV3 this week launched a bold 'Pacific loophole' plan to evade strict Sunday morning advertising laws. But doubts remain about the legality. The Ministry for Culture and Heritage says TV3 could still be breaching the Broadcasting Act. TV3 had previously confirmed it would play commercials at this time - starting with tomorrow's quarterfinal between the All Blacks and the host nation France in Cardiff - but had not revealed how it would achieve this within the restrictions in the law. [All Blacks beaten by Michalak's magic]. TV3, in an arrangement with Fiji TV, will be transmitting its entire signal for the event to 18 countries and territories in the Pacific. The additional countries or territories that the signal reaches are: Tahiti, Cook Islands, Tonga, American Samoa, Samoa, Tokelau, Tuvalu, Niue, Kiribati, Nauru, Fiji, Solomon Islands, Vanuatu, New Caledonia, Papua New Guinea,Guam, The Marshall Islands, Northern Marianas. 3. 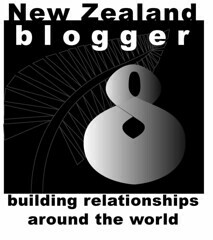 Be targeted primarily at audiences outside New Zealand. Who is convinced by TV3's claim about the primary audience outside NZ? It is a wildly optimistic estimate of a potential audience based on population only. And it is a dubious argument to be claiming a combined Pacific population of more than nine million - more than double New Zealand's population, when the critical figure is potential audience. Most of the 18 countries and territories listed have a limited interest in rugby union. While it is true Papua New Guinea (6.2 million cited by TV3) has a far larger population than New Zealand, the TV audience is very small and the country is primarily a rugby league nation. Eighty percent of the people are rural villagers with limited access to TV and electricity. Various estimates put the potential TV audience for the national broadcaster EM TV (owned by Fiji TV's subsidiary Media Niugini) at between 500,000 and 600,000. The rugby broadcasts would be catering for a relatively small expatriate market and local audience. There will be strong and enthusiastic audiences in Fiji, Samoa and Tonga, of course, and Tahiti and New Caledonia (and perhaps Vanuatu) would have a keen interest in the France-All Greys quarterfinal at least. But it is hard to see much of a potential audience in some countries and territories such as Guam, the Marshall Islands and Northern Marianas. Good to see PNG's new National Capital District governor Powes Parkop having a crack at the local media for its appalling job in recent times at covering the plight of their 'bros across the border in Indonesian-controlled Papua. The issue of 10,000 or so displaced West Papuans and their requests remains a festering sore. And the PNG media haven't done enough to address the problem and ensure it is on the agenda for weak-kneed politicians. Ironical, because there are many influential Papuan journalists in the PNG media industry and in the past they have prodded local newspapers, radio and TV into keeping an eye on the Papuan problem. 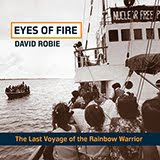 Powes always supported the Papuans in their struggle for self-determination right from his Melanesian Solidarity activist and human rights legal work days. Now we wish him luck in the to job at NCD. 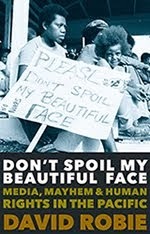 He took advantage of the launching of PNG's 'Let's do it' media expo 2007 to slam the media for accepting Papua as a "taboo" topic. He wasn't too full of platitudes about the coverage of the decade-long war on Bougainville, which ended in 1997, either. Parkop said he couldn't recall when journalists had tried to report the Papuan story on the other side of the border without Indonesian thought police. He said: The media seems to have swallowed the political line that West Papua is part of Indonesia and whatever is happening there is a matter for Indonesia ... It seems that as far as the media is concerned, West Papua is A TABOO . It's a domestic affair similar to how we treat domestic violence. 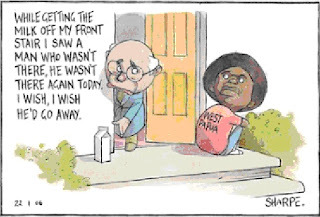 Cartoon: Sharpe's view of John Howard's closed door attitude to West Papua - it could easily apply to the PNG media attitude to Papua.